Songs of Change – meets on Tuesday nights at Paganhill Maypole Village Hall. We are led by Sophie Sterckx (formerly “Greatorex”). This is an open group drawing on songs from about peace, the earth, equality, etc. We are next performing before the start of the International Workers Day procession. We will again be presenting our Open Homes weekend, this year on the Bank Holiday weekend of May 3rd and 4th, 2014. There will be lots of Eco-renovation to see and yo u will get a chance to talk to the home owners about what they have had done, who did it, what difference it has made. Some of the homes will have small workshops for you to pick up more information. Launching Jay Ramsay’s first large collection of new poetry for some years, here in Stroud at the Black Book cafe, top of the High St, on FRIDAY MAY 9th—at 7.30 for 8pm start. £10 on the door includes a free copy. The book, which is 224pp, attempts to tell the transitional story of our time...also as an invitation to poetry to face what is happening in our time. It is an invitation for us all to find our greatness and courage, and not hide in being less than who we are. It is also about memory (and history), and what needs to be remembered in our soul's journey of awakening. There will be music too, and some special guests. Saturday May 10th 7.00 pm to 10.30at Severn View Academy, Bisley Old Road, Stroud GL5 1NL. There will be shared vegetarian buffet food and drink; you’re welcome to bring some. There will be time to talk, and time to dance to Brian’s wonderfully eclectic sound tracks. We also have a place to sell clothes and other items you might like to donate so feel free to bring those along - you might also pick up a bargain - thank you! This event is a joint fundraiser hosted by Brian Tasker, Pammy Michell and Paul Shevlin to support a School Project in Cambodia (Pammy and Paul) and the project to bring Playback Theatre project to South-East Asia (Brian Tasker of Makeshift Theatre). and click on 'travel blog'. You can read about the work of Makeshift Theatre and Pammy and Paul have a guest blog - do have a look! We are inviting entrance donations on the night. All proceeds after hall hire expenses to be split between the two projects. This is a friend-friendly event so we are inviting friends who we hope will invite friends to make this evening a big success! Come early and stay until the end! Or just pop in. The venue is easy to find: Continue up Parliament Street past the police station which becomes Bisley Old Road, to the very top of the hill and the school is on the left. Please park in the car park and then walking towards the school, look for the gate in the fence between two buildings. Walk through the gate and turn left and there we are in that building! Thursday 22nd May Local and European Elections. Molly Scott Cato is your Green candidate for Europe and everywhere a District Council seat is being contested, you have the option of voting Green. Stories from Pictures. 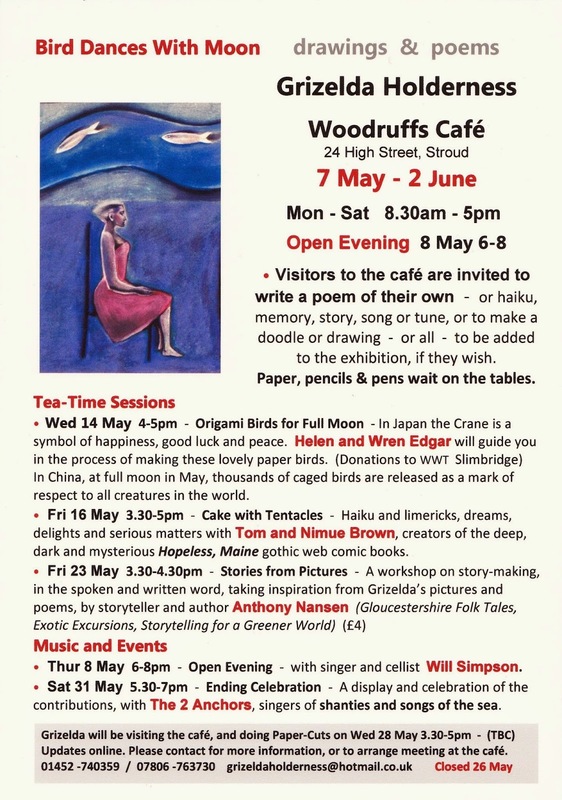 A tea-time workshop on storymaking, in the spoken and written word, taking inspiration from Grizelda Holderness’s exhibition of pictures and poems ‘Bird Dances with Moon’. Facilitated by storyteller and author Anthony Nanson. 3.30-4.30 p.m. £4. Woodruffs Cafe, High Street, Stroud. Contact: 01453 840887.